In a small bowl, stir together brown sugar, ground ginger, salt, garlic salt, black pepper and red pepper. Rub pork with the spice rub. Wrap in plastic wrap and refrigerate overnight. Let the pork stand at room temperature for at least 1 hour before preparing. In a large bowl, toss together cabbages, bell pepper, vinegar, onion, sugar, oil, mayonnaise, celery seed, salt and mustard. Serve pork on buns topped with slaw. Set the Multi-Function Cooker to Sear/Sauté Mode, HIGH. Press Start. Add oil to the Multi-Function Cooker. 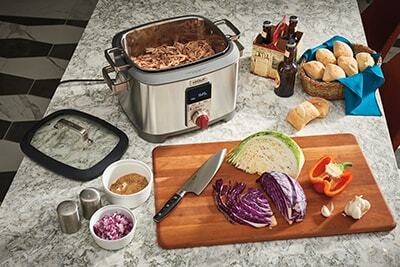 Place pork in the Multi-Function Cooker when oil is shimmering. Cook for 3 to 4 minutes per side. Set the Multi-Function Cooker to Program 2 Mode. Add ginger beer, vinegar and garlic. Cover and set the Multi-Function Cooker to Program 1 on HIGH for 1 hour. Set Program 2 on MEDIUM for 5 hours. Press Start. Cook for 6 hours. Shred pork, and discard fat and bones. Toss pork in the drippings for additional flavor.